Apple has released the final version of tvOS 12, which makes a series of important changes to the Apple TV and Apple TV 4K, most notably the introduction of long-delayed Dolby Atmos support. If an Apple TV hasn't already downloaded the update automatically, the upgrade can be forced by opening the Settings app, then selecting System, Software Updates, and finally "Update Software." Dolby Atmos is an alternative form of surround sound that simulates sounds in 3D space instead of merely pushing them to different channels. In September 2017 Apple said it would support the format in a future tvOS update, but months went by without news. The company finally broke its silence at WWDC 2018 only to say people would have to wait for tvOS 12. Another important upgrade is "zero sign-on," which will let people authenticate a (compatible) cable provider simply through location and network data, skipping any need to enter credentials. Similarly Apple is bringing password AutoFill to tvOS, meaning that when people do have to sign into an app, that process can be extremely quick. 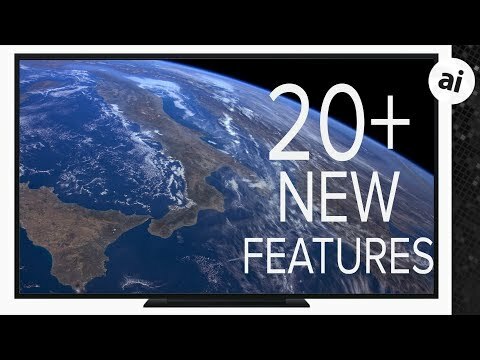 Other changes include compatibility with third-party remotes, new NASA screensavers, and a guest feature which presents a pairing code for people with an iOS device within a foot of the Siri Remote. One of the new NASA screensavers. The tvOS version of Siri has gained the ability to find other Apple devices, and will also work through third-party remotes. Atmos finally here... home theater upgrade time! I would suggest waiting to see what movies support it... I upgrade for ATMOS for Netflix and guess what, they only offer a few movies!! And further to that, Apple is only offering it to their rentals, not all of their apps you subscribe to, i.e. Netflix, Prime, Hulu, Vudu, etc. That's not true at all. I just updated tvOS and a ton of my owned movies have been upgraded to Dolby Atmos. It's just not rentals that support it. I tested a few and Dolby Atmos sounds great. Vudu supports Dolby Atmos on Apple TV as well. I just tested it out on Vudu with several movies. Since the Apple TV supports Dolby Atmos, any streaming app can offer Dolby Atmos as well so your information is wrong. I've been testing out some more movies that support Atmos. It looks like at the moment, not all are actually playing in Atmos even though it says the movies support it. A few examples, the Amazing Spiderman and the sequel aren't outputting in Atmos even though it's listed on the movie. Oddly, both movies play in Atmos on Vudu. What is the impact of Dolby Atmos on HomePods?? How do you select the NASA screensaver? Atmos wouldn't work with a HomePod. You can swipe left/right now to change screen savers. I looked and I don't have the new NASA ones. I have the download new video setting at Weekly so I assume they haven't been downloaded yet. I read in another forum someone called Apple Support because they didn't see the new screen savers and they said it could take hours/days for them to download. None, since a single HomePod can only do mono and you need two for stereo (and that will only work if Apple has released the update that supports it.) And Atmos generally requires a minimum of 11.1 channels (although if you have fewer, Atmos will place the sound in the speaker closest to where it was intended): Left, Center, Right, Left Side Surround, Right Side Surround, Left Rear Surround, Right Rear Surround, Left Front Height, Right Front Height, Left Rear Height, Right Rear Height and subwoofer. And even that is lame compared to Atmos in a movie theater which can have 64 concurrent objects of sound. HP isn’t stereo but neither is it mono, as it does channel separation on its drivers, including left and right channels.